These wheat cakes are called Gateaux for many and Gateau as one. There is a little mark above the A, but I am going to ignore it and hope it goes away. 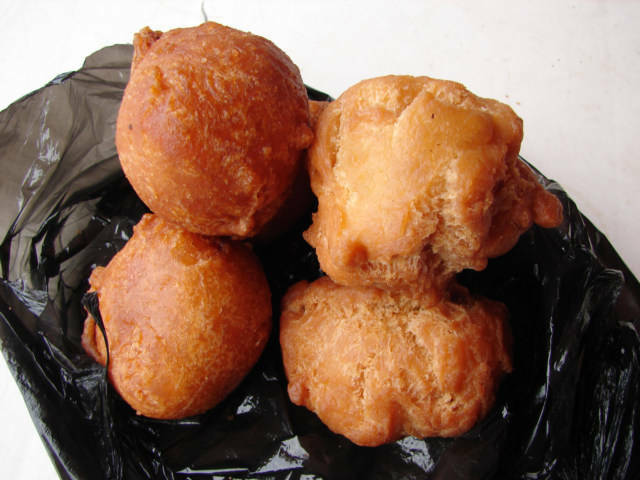 Next comes the Mina Language, I can ask for a Gateau, and the locals will try to give me what they have close to them, the word Gateau is a general word for cake, however normally here in Togo means these round things. On the left is the type called Batoken and is smooth, and on the rough one on the right is an Achtomon in the Mina language, maybe I say Gateau Batoken if I want the left type and maybe I say Gateau Achtomon if I want the right. The truth is, I do not say either one if I can see them, I just point at the one I want, and saves many silly communication headaches. My goal is to communicate first, and learn the language second, better to be a good communicator than good in languages. Then point, or hold my palms up, and in universal language of hand talk, I will say where is Achtomon? I like to communicate first and learn a language second. I guess soon I will climb the French ladder and figure out what is the difference between a Gateau and a Beignet. As I see it, they both are deep-fried in oil, so I cannot say the Gateau Achtomon was bake and a cake. I saw is my favorite Gateau deep fried in the street in front of my eyes, and I like to see my cook, it makes me feel safer to eat. I forgot, there is probably a word for Gateau in the Mina Language, I could learn that and forget my French. Would I be learning to communicate, or would I be learning a language?